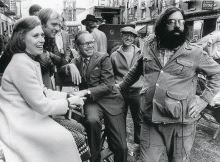 By the time he made The Godfather, at the age of 33, Francis Ford Coppola had already had a decade’s experience in the movie business, co-earning an Oscar for Best Original Screenplay for the biopic Patton. Even that, though, didn’t make getting the film greenlit an easy or sure proposition. With pressure coming from all sides (several of them armed), Coppola began the first of his epic, career-long battles against everyone and everything that would stand in the way of his vision. Time and again, the director has gambled Sometimes, he’s won, and very big. Sometimes, not so much. But whatever it is, he gives his all (including property). Now learn some of his tricks of the trade as Coppola, (along with the recently late DP Gordon Willis, Brando, Pacino, Caan, et al.) outwits everyone to make an American classic, his way in this 1990 doc, The Godfather Family: A Look Inside.